It was called “Broadband for All” — New York Governor Andrew Cuomo’s commitment to bring high-speed internet service to every New York State resident. 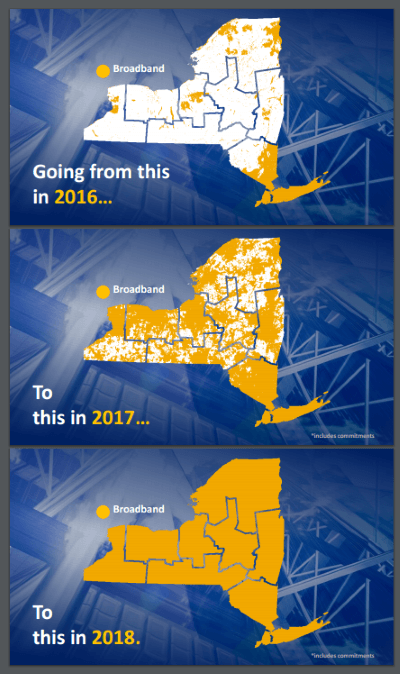 But it now appears the governor will break that promise and leave more than 72,000 rural New York residents with satellite-delivered internet that does not come close to meeting the broadband speed standard and is infamous for customer frustration, slow speeds, and low data caps. In 2015, Governor Cuomo made the largest and most ambitious state broadband investment in the nation, $500 million, to achieve statewide broadband access by 2018. The New NY Broadband Program sets as its goal access to speeds of 100 Mbps for all New Yorkers, with 25 Mbps acceptable in the most remote and rural areas. The cost must not exceed $60 and there is a general prohibition of data caps. This goal exceeds requirements of the FCC’s Connect America Fund program and requires that projects be completed on a more accelerated timeline. Today, the governor announced the state grant winners to split $209.7 million in the third and final round of awards to offer 122,285 additional homes, businesses, and institutions broadband internet service. “These latest awards through Round III of the New NY Broadband Program will close the final gap and bring high-speed broadband to all New Yorkers in every corner of the state,” the governor’s office claimed. Tucked in among the grant award winners is a $14,889,249 grant to Hughes Network Systems, LLC, targeting 72,163 rural New Yorkers, more than half of the total number of customers to be reached in the third round. Hughes operates the HughesNet satellite internet service, a technology derisively known as “satellite fraudband” for routinely failing to meet its advertised speed claims. It’s also known as “last resort internet” because it is slow, expensive, and heavily data capped. Pat (last name withheld) lives 1.3 miles from the nearest Charter Communications customer in Niagara County, near Niagara Falls and is very disappointed with recent developments. Charter has quoted an installation fee of $50,000 to extend their cable service and Verizon has refused to provide DSL service, leaving Pat resorting to using an AT&T mobile data plan, which is expensive and gets throttled after using more than ~22 GB a month. Stop the Cap! readers have told us satellite internet is the worst possible option for internet access, and many have reported better results relying on their mobile phone’s data plan. But New York’s solution for more than 70,000 of its rural citizens — many that believed the governor’s commitment of 100% coverage — is to saddle them with satellite internet access starting at $49.99 a month for a paltry 10 GB of usage per month. 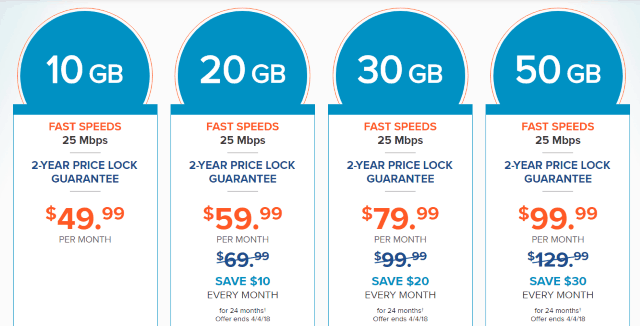 The top plan on offer costs $99.99 a month and is capped at 50 GB a month before a speed throttle kicks in and reduces speeds to dial-up levels. A 24-month contract is required with a very steep early cancellation penalty. Another surprising winner is Verizon Communications, a company that originally refused to participate in rural broadband expansion efforts. Verizon will accept more than $70 million to expand its broadband service to 15,515 homes, businesses, and institutions in the Capital Region, central New York, the North Country, and Southern Tier. At press time, it is not known if Verizon will bring FiOS or DSL to these customers. Because New York State relied on private companies to bid to cover unserved residents, it seems clear HughesNet is the default choice for those New Yorkers stranded without a telecom company bidder. Although that will allow Gov. Cuomo to claim his program reaches 99.99% of New Yorkers, the rural broadband problem remains unresolved for those who were depending the most on New York to help bring broadband to rural farms, homes in the smallest communities, and those simply unlucky enough to live in small neighborhoods deemed unprofitable to serve. So what is the punishment for HughesNet if/when they can not supplied the speeds and data caps that have been outlined by the contract? After reading your first article I thought awesome a state that is finally getting tough on the providers. if anyone can make a rock solid contract New York can. Unfortunately I have to agree I see the walk back already starting. They should of had a contingency plan before promising things based on there fate of providers. I think Pat’s quote has a lot of merit. The Broadband Program Office was optimistic that with matching funds available, there would be no reason not to serve everyone, or close to it. Don’t get me wrong — I doubt the third round would have actually had enough funds to reach EVERY New York resident that wanted service. I think the state underestimated provider intransigence to invest in low/non Return On Investment areas. In Pat’s case, Charter wanted $50,000 to extend cable service to a home that is 1.3 miles from the nearest Spectrum customer. I don’t know if that is the only home that would be served, or if extending service that way would open Spectrum’s infrastructure up to Pat’s immediate neighbors as well. If so, Pat would be paying to subsidize Charter service to more than one home, which seems unfair. Is $50,000 a lot? Not really, actually. But then reaching rural New York was always going to involve significant initial investment. The last 25,000 or so unserved residents are going to be very costly to reach because they live far away from incumbent providers, are in a cabin in the Adirondacks, or perhaps some other remote wilderness area. There may have to be some sort of different subsidy approach to reach these people, but the goal should always be to deliver actual broadband, and although satellite has marginally improved, it is still no replacement for consistent speed, cap-free internet access. Could satellite be part of the solution for some? Of course, if It was capable of delivering stable speeds and no caps. If New York was spending this money to buy and reserve a certain amount of bandwidth exclusively for these residents, so they would not be competing with every other satellite broadband customer in the region, it might even work well, at least until better solutions can be delivered. Having 72,000 stranded New Yorkers stuck with HughesNet is too many. The state needs to find a better solution for most of them. I find many of the things on here disturbing.., ” It also gives $70 million to Verizon who declined funds in first place.” “At press time, it is not known if Verizon will bring FiOS or DSL to these customers.”.. DSL, for the most part, does not fit the description as “broadband”, anymore.. Broadband is now 24 Mb down.. Most DSL, from what I know, is WAY under that..
“that will allow Gov. Cuomo to claim his program reaches 99.99% of New Yorkers”.. Sad, but first he does not get his facts right, then he makes promises that he can not keep, and then uses a twist to make an excuse, to try and make it look like he did what he promised.. and in the end, it was nothing but a lie..
“A 24-month contract is required with a very steep early cancellation penalty.”.. My question is, if this is a contract with the state, to get everyone internet service, then why is there any kind of cancellation penalty in the first place?? “Charter wanted $50,000 to extend cable service”.. If that was me, I would say, OK, but I want it in writing that “I OWN” that cable, and you can not use it for ANYONE else.. Because, if they can not guarantee that, then guess what.. they sold you something that they did not deliver.. It is like selling someone a gallon of milk, and then just giving them the container.. Fact is, if she pays for that cable, then she owns it.. Which means, she can take it down at any time too.. If not, that is fraud..
We now know Verizon will use fiber as a substantial part of its expansion. However, they can meet the FCC’s speed definition using VDSL and not have to run fiber direct to homes. It seems likely fiber to home service would be necessary to achieve 100 Mbps, but the speed standard for rural areas in this program is lower. We also know very little about HughesNet and this program. HughesNet is already available so presumably this money will somehow subsidize the service for rural New Yorkers. How it does that I do not know. It could be free equipment, it might be no contract. All we know now is what HughesNet is selling nationwide. I’m afraid I might be one of the 72,000. I have DSL now and have had Hughes prior to that. I can tell you DSL is much better than Hughes. It’s very slow, but at least there’s no cap and the speeds have been consistent for the past year since fewer people have to use it now. I’m in Malone (North Country) and it’s mostly Spectrum around here. I’m hopeful even though my census block is not a part of Round 3 that Mohawk Network’s fixed wireless will still reach my area. They are expanding around here very quickly and it looks like census blocks near me are getting their service. Since it’s wireless, it would assume I can access it by default. I unfortunately am also one of the few (many) who will still be left with satellite as my only option. We’ve had Hughesnet for about a year and a half when we moved here to the hilltowns of rural Albany County. It’s equivalent to a half-step above dial-up and that’s being generous. The caps are ridiculous. Once you’ve “used up” your data, (and we only use internet for email, social media, etc… no streaming), the speed is reduced so badly it’s horrible. I can log onto my email, go do a load of laundry and mow the lawn… and the page still hasn’t loaded. Not to mention the price is outrageous. Unfortunately it’s our only choice. When I heard about this new NY Broadband I got excited, but to no avail. What makes it even more painful is that we’re not even that far out. Spectrum is installing 2 miles up the road in one direction and Verizon a mile and a half in the other direction. Just another case of “we promise everyone will get this… well ALMOST everyone, but not you… sorry!” So many people complain about DSL. I’d give my right arm for DSL right about now!